We have installed a washpoint for your convenience so that when you have been away (or indeed before you go) you can wash your vehicle. Be it a car, caravan, trailer tent or motorhome - you can wash it now in the convenience of Willow Tree. Ideal to remove any dirt or dust from the road prior to putting your outfit back into storage. 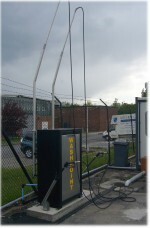 The wash operates on tokens and the cost is £8.50 for 20 minutes. Arrangements for servicing is available for your convenience through our approved caravan workshop servicing partners J. B. Caravans For further details, please ask at reception.